I approached slowly, feeling a gentle pull, as if by a magnetic force. Then, I wanted to stop, cement my feet to the ground, and simply stare. My mouth gaped open, like an opera singer belting an aria, as I tried to comprehend the extreme, yet serene view. Ahead of me lie a bevy of marble domes, four towering minarets, and a thousand jeweled columns rising from delicate inlaid floors. Yet, I had thoughts of Aladdin and magic carpets in my head. My western upbringing slipped back to childhood storybooks. I recalled pictures from the Tales of 1,001 Arabian Nights. Since I’m not an experienced Middle East traveler, the architecture seemed exotic and foreign. The Sheikh Zayed Grand Mosque in Abu Dhabi, United Arab Emirates, is (of course) a religious shrine and not a fairytale fabrication. The pure white-on-white structure is an astonishing architectural treasure, a tranquil site that seems too beautiful to be real. I foresee it earning iconic status, like Notre Dame or the Taj Mahal. Perhaps it will replace one of the 7 New Wonders of the World when it becomes more widely recognized. 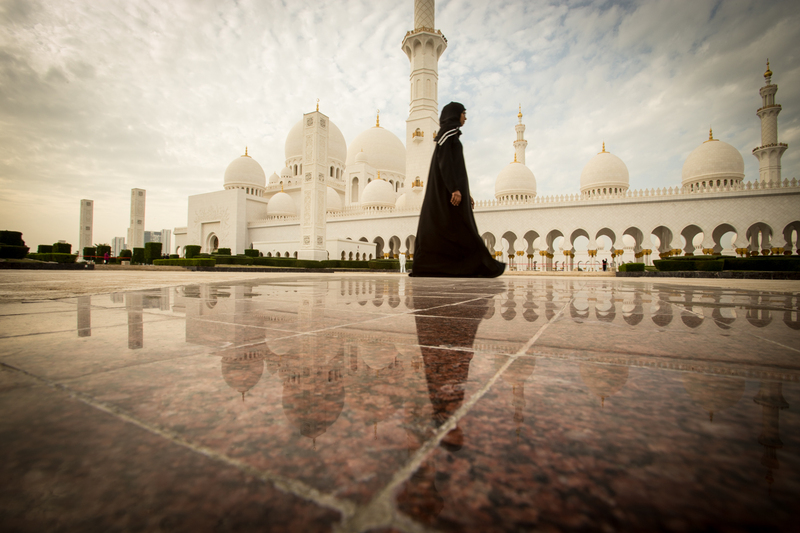 The Grand Mosque began as a dream in the heart of the late Sheikh Zayed bin Sultan Al-Nahyan. Plans for the building were developed in the late 1980’s; however, construction didn’t start until November 5, 1996. At one point, more than 3,000 workers were employed onsite. Today, the 241,220 square foot complex is equivalent to about five NFL football fields and can accommodate 41,000 worshipers, approximately 10,000 of those on the interior. Although some areas, like the gardens, are still under construction, the internal prayer halls first opened in 2007 and have remained in use since. The public is welcome to visit on their own or for guided tours inside and out, except on Fridays when only Muslims may enter. Dress rules should be followed and black gowns, called abayas, are available for women needing additional covering. Tour guides are very open to answering questions and mine did his best to help me understand the country’s prevailing religion. 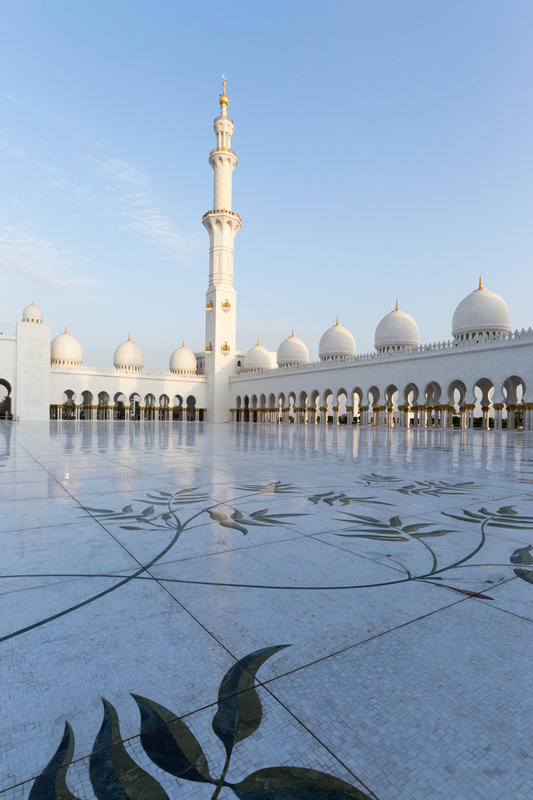 The Grand Mosque features more than 80 domes of Moroccan design or onion shaped crowns, all decorated with white marble. The main dome’s outer shell measures 107 feet in diameter and stands 279 feet tall on the exterior – the largest of its kind, according to the Turkey Research Center for Islamic History and Culture. While huge and gracefully divine, it is not the same shape nor as immense as Brunelleschi’s dome in Florence or St. Peter’s Basilica in the Vatican. 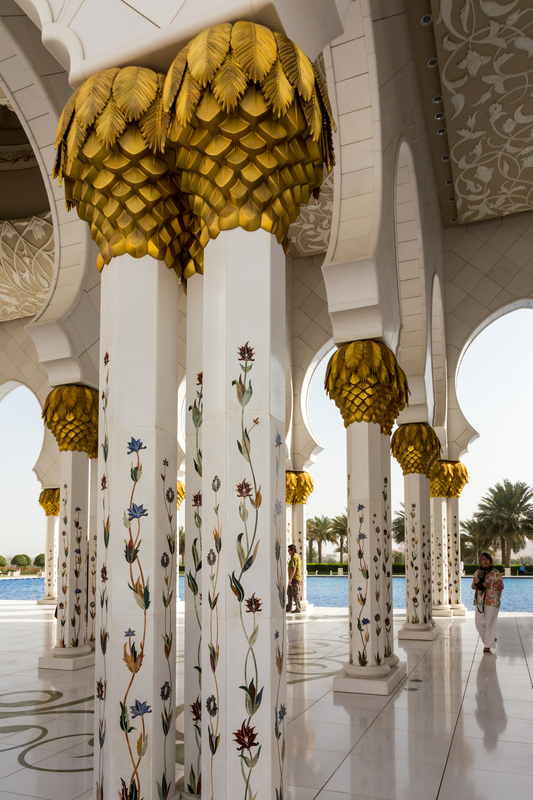 You’ll find 96 columns in the main prayer hall all inlaid with mother of pearl. The world’s largest chandelier is suspended under the main dome and weighs over twelve tons. The sparkling jewel represents the date palm; the tree that sustains life in this desert region. There are six additional chandeliers and all feature thousands of Swarovski crystals from Austria and glass-work from Italy. I’d say, “gargantuanly gorgeous” is an understatement. You’ll also find yourself standing on the world’s largest hand-knotted carpet. The Mosque’s Visitor Services states, “It was designed by Iranian artist, Ali Khaliqi. The carpet consists of 2,268,000 knots all hand-crafted by approximately 1,200 artisans in small villages near Mashhadin in Iran, a region renowned for its carpet making.” The staff change the sanctioned off visitor walkways daily, to even out wear on the rug. The Qibla wall faces the direction of the Holy City of Mecca, the direction used during prayers. The expanse, measuring 75 feet high by 164 feet wide, contains subtle fiber-optic lighting giving it a faint ethereal glow. Inscribed on the wall, in traditional Kufi calligraphy, are the 99 names or qualities of Allah. My guide explained these with examples such as “the Most Merciful, the Almighty, and the Judge.” The Mehrab (niche found in the middle of the Qibla wall) is showcased with golden-glass mosaics. Interior spaces are roped off for those who have come to pray. Arches detail at the Grand Mosque. While security does not permit wandering just anywhere, the grounds are so spacious; it remains possible to find quiet retreats. The outdoor reflection pools adjacent to the arched colonnades called to me. I could have sat there pondering the perfection in this peaceful place for hours. As the sun was setting, I heard the traditional call to prayer and watched the faithful file in; many were workers at the Mosque. I photographed the exterior arches and domes as the sky darkened and the site came alive, literally glowing with illumination. 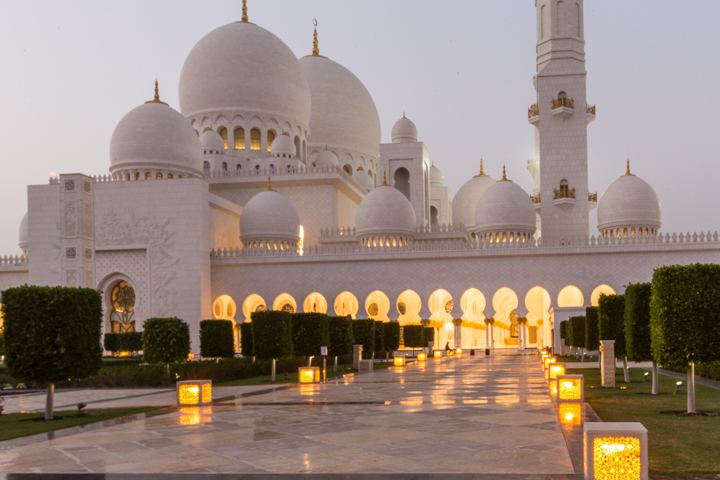 Visitors to Abu Dhabi should see the shrine by day and night to fully appreciate its grandeur. 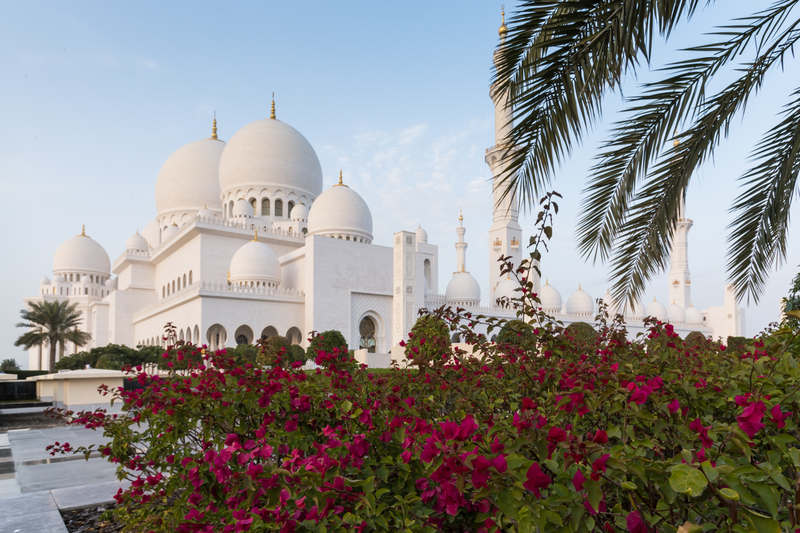 Similar to grand Gothic cathedrals, now over a thousand years old, the Sheik Zayed Grand Mosque will develop and mature as a pilgrimage site for Muslims and tourists during the next millennium. Tis humbling to stand in a relatively new sacred place, yet realize that millions will witness the powerful spot over time. 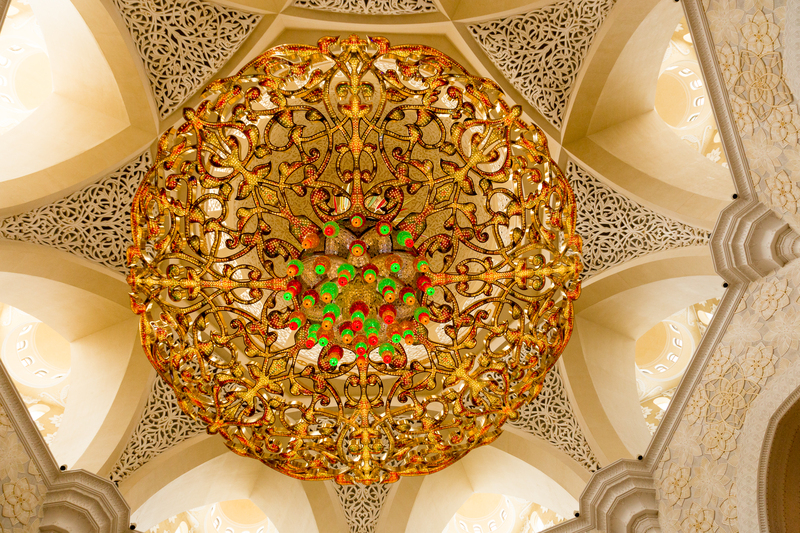 The United Arab Emirates has created a sublime work of art that can withstand the test of time. To read the Luxe Beat Magazine version of this article click on the title Abu Dhabis Beauty Sheik Zayed Grand Mosque UAE.